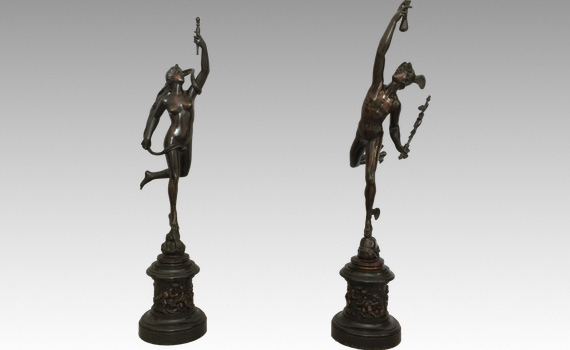 A pair of late 19th century Italian “Grand Tour’ style bronzes after the antique. The figure of Mercury depicted with winged feet & helmet, holding a Caduceus in hand, Fortuna wrapped in flowing robes. Both raised on a blowing Zephyr with turned Belgian marble plinths and cast bronze bands of Cherubs depicting the Arts. Both in good original condition. Minor chips to bases.